Optometrists have long been at the forefront of research into the vision problems and their relationship to the brain. Optometric vision therapy, for example, has been shown in studies to be more effective than patching alone in the treatment of amblyopia. Patching involves covering the good eye so that the weak eye is forced to received and process stimuli. The basic principle is that active therapy for the weaker amblyopic eye will improve acuity as well as promote properly functioning binocular vision. 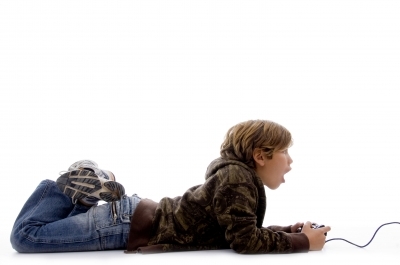 Many optometric clinics use video games as part of a vision therapy program to treat amblyopia. Now a number of studies have now shown that this approach is effective. In one such study, Optometrists at the University of California at Berkely did a pilot study that has found that playing video games can help improve the vision of adults with amblyopia. The study found that participants experienced marked improvement in visual acuity and 3-D depth perception after spending just 40 hours playing off-the-shelf video games. “This study is the first to show that video game play is useful for improving blurred vision in adults with amblyopia,” lead author Dr. Roger Li, research optometrist, was reported as saying. “I was very surprised by this finding; I didn’t expect to see this type of improvement.” I don't think that most optometrists would be surprised. The results confirm the clinical experience of those of us who use vision therapy to treat amblyopia. The study was published in the August 2011 issue of the journal PLoS Biology and is freely available online. Amblyopia is a brain disorder in which the vision in one eye does not develop properly. It is the most frequent cause of permanent visual impairment in childhood, affecting around 3% of children. But amblyopia is not just a problem for children. It is also the most common cause of one-eye visual impairment among young and middle-aged adults. Amblyopia in children can be often be successfully treated but adults do not generally respond as well to traditional treatment. Many eye doctors feel that treatment is hopeless after the age of 8 or so. However, the outlook is not so bleak in the light of recent research into perceptual learning which has challenged the orthodox idea that no vision improvements are possible in adult amblyopes. Research has shown that that intensive training on a perceptual task -like the kind of exercises prescribed in optometric vision therapy- such as getting two horizontal lines aligned, could lead to a 30-40 percent improvement in visual acuity. Since the PLoS Biology study on video game therapy, others have reached a similar conclusion. Researchers from India reported similar findings from a study that looked at video game therapy for children at the American Academy of Ophthalmology 2011 Annual Meeting. Children who had video game therapy showed 27% better vision improved that those children that were treated with patching along. Optometrists who treat amblyopia have been saying for a long time that patching alone is not sufficient. I'm happy to say that the recent research is proving them right and I hope that parents and patients with amblyopia get the message. Image courtesy of imagerymajestic / FreeDigitalPhotos.net. A California eye doctor has come up with a $5,000 laser procedure - that takes only 20 seconds to complete - that will turn your brown eyes permanently blue. You can read about the details here. The long term risks are not known but that has not stopped thousands of people from contacting the doctor about the procedure. For some reason, lots of people prefer blue eyes to brown. I assume that the reason is a purely aesthetic one: they think it just looks better. Science has nothing to say about whether something is aesthetically better than something else - that is the job of philosophers, poets and artists. However, science does have something to say about which eye color may be better physiologically. I've written in the past about intra-ocular light scatter, a phenomenon that results in blue-eyed individuals experiencing more glare because their blue eyes do not absorb enough light. That's one drawback to having blue eyes. Another drawback to blue eyes is that, according according to the National Cancer Institute, light colored eyes are a risk factor of iris melanoma, which is an eye cancer. People who have this procedure done should do what all blue eye individuals should do, wear anti-glare lenses to reduce the glare and wear UV protected sunglasses to keep sunlight and UV radiation out.